LONDON, June 29, (AFP): Marcus Willis’s Wimbledon fairytale came to an end against Roger Federer, but the British qualifier’s 6-0, 6-3, 6-4 defeat couldn’t ruin a day to remember for the new star of the All England Club. Willis has captivated the tennis world with his rags to riches rise and although the world number 772 was unable to spring what would have been Wimbledon’s greatest upset, he enjoyed every minute of his unlikely second round meeting with world number three Federer. 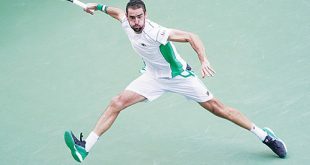 The 25-year-old hit 24 winners, served nine aces and twice came within a whisker of breaking Federer, all while displaying the effervescent personality that has made him such a fan favourite. “It sounds funny but I am disappointed to lose,” admitted the Englishman. “It’s daunting. It’s tough. I was playing alright at first, I settled into the match. I was enjoying it. If I was playing well and competing with Roger for a couple of sets I was doing well. Given the thankless task of raining on Willis’s parade, Federer was in business-like mood amid the raucous Centre Court atmosphere and now plays Dan Evans or Alexandr Dolgopolov in the third round. “It was very different. 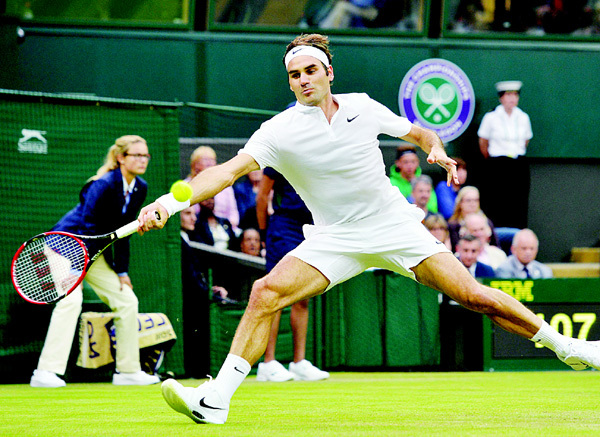 Marcus brought some unbelievable energy to the court with the fans, his play and his personality as well,” Federer said. “It was very refreshing. I always knew it was going to be a completely different match than I’d played at Wimbledon before. Just months ago Willis, who works as a coach to children and senior citizens at the Warwick Boat Club in the English midlands, was considering calling time on a tennis career that appeared to be going nowhere. But, persuaded to give it one last shot by his new girlfriend, Willis battled through to the main draw at Wimbledon via six qualifying matches before beating world number 54 Ricardas Berankis in the first round. 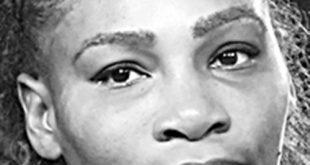 His reward was spending 84 minutes trading blows with a seven-time Wimbledon champion and, given the massive gulf in class, Willis acquitted himself better than most expected. Wearing an expression of bemused delight throughout the warm-up that suggested he could scarcely believe where he was, Willis gave the impression of having been picked out of the crowd to play the 17-time Grand Slam champion. 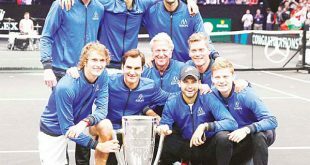 When he won his first point in the opening game after a Federer miscue, Willis, cheekily playing in a shirt monogrammed with the Swiss great’s ‘RF’ logo, pumped his fists as the crowd erupted. World number one Novak Djokovic racked up his 30th successive Grand Slam victory on Wednesday. Defending champion Djokovic brushed aside Adrian Mannarino, who was celebrating his 28th birthday, 6-4, 6-3, 7-6 (7/5) to reach the third round. The top seed, bidding for a third consecutive title at the All England Club and fourth in all, will face either American 28th seed Sam Querrey or Thomaz Bellucci for a place in the last 16. Djokovic’s match was played under the roof of Centre Court as heavy rain brought chaos to the schedule. Only 15 minutes of play was possible on the outside courts up to the late afternoon causing 22 singles matches to be cancelled and men’s doubles ties to be reduced to best-of-three setters. “Fortunately I was scheduled on Centre Court, that helps on days like this and when the roof is closed the atmosphere gets even more special,” said 12-time major winner Djokovic. Under the Centre Court roof, Polish third seed Agnieszka Radwanska reached the last 64 with a 6-2, 6-1 win over Ukraine’s Kateryna Kozlova to preserve her record of having never lost in the first round at Wimbledon. Radwanska, the 2012 runner-up, will face either Karin Knapp of Italy or Ana Konjuh of Croatia for a place in the last 32. Such was the ease of her victory that part of her news conference dealt with questions over the Brexit vote and reports of hostility towards the Polish community in Britain. “Well, I know there’s a lot of Polish people working, living here. I’m not aware of every comment, so I don’t think I should comment on it,” she said. Czech 10th seed Tomas Berdych, the runner-up in 2010, just had enough time to complete his first round tie held over from Tuesday. He defeated Croatia’s Ivan Dodig 7-6 (7/5), 5-7, 6-1, 7-6 (7/2) and next faces Germany’s Benjamin Becker. “It’s good to be done, especially when my opponents finished yesterday,” said Berdych. The rain caused a number of high-profile matches to be cancelled until Thursday. 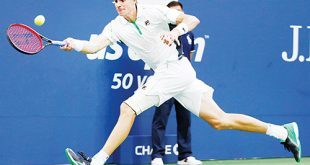 They included Japanese fifth seed Kei Nishikori against France’s Julien Benneteau and former US Open champion Marin Cilic’s clash with Sergiy Stakhovsky. Also shelved were second seed and French Open champion Garbine Muguruza’s second round tie against Slovakian qualifier Jana Cepelova. 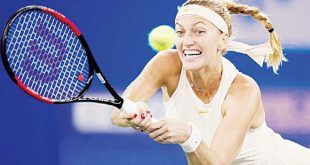 Venus Williams’s match with Greek qualifier Maria Sakkari and Australian Open champion Angelique Kerber’s tie with Varvara Lepchenko of the United States were also called off.